Includes: bra, belt+skirt, arm bands, wrist cuffs, necklace, headband, half-circle chiffon veil. Fabric metallic gold lycra and red and golden pleated chiffon. Beading: gold, multicolor, small gold coins, big red beads, AB crystal stones. Bra: with cutouts B/C cup. 35" from end to end under bust. Belt+Skirt: belt with cutouts 36" from end to end (front 17", back 20", currently set to fit 34" upper hip). 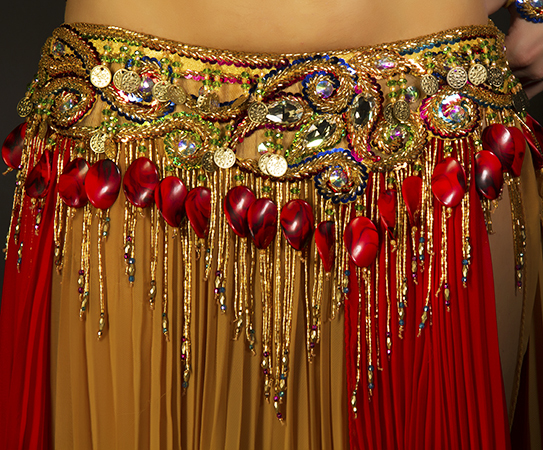 Pleated chiffon skirt with red panels and one slit attached to the belt. Length 39".